There's a coziness to the Sunday mornings of September unlike the rest of the year -- blue brightness mixed with crisp air, a thin film of Summer warmth still clinging on. Birds still wing out in our cherry tree and search for what's left of the sun-dried blueberries on our blueberry bushes. Mosquitos still puff up on the wind. You can see their soft forms float upwards with the evaporating dew. I like envisioning my weekends full of slow, tempered projects -- easy Saturdays listening to the radio over morning coffee, putting together wedding crafts, working in the yard, collecting our produce from the week at the local market. 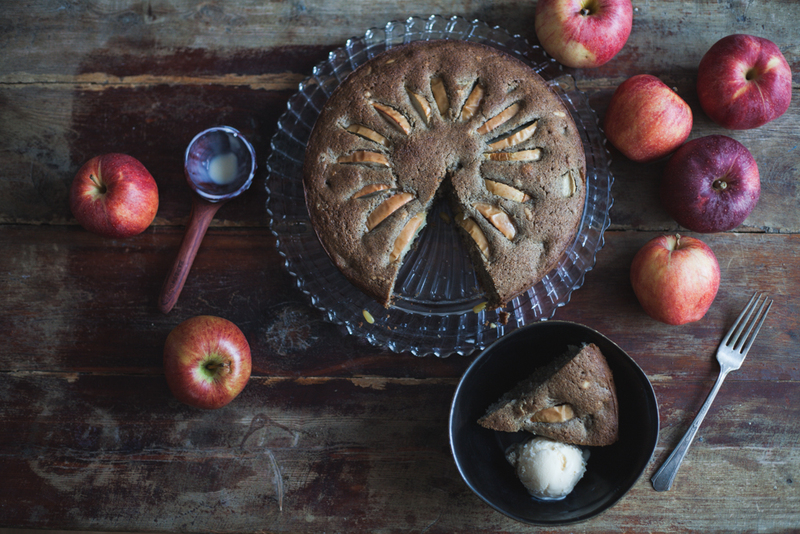 Sundays are perfect for baking pies and cakes, like this sweet apple cake. We often make Sundays our chill night, where we eat leftovers and watch movies. But I like to make something sweet and homey to enjoy, at some point in the day, to have post-dinner. I'm really feeling the pull of making cakes on Sundays as we enter into the cooler months of the year. Honestly, I just like having something special to pair with the great coffee we've been brewing in the mornings. Fruit-focused cakes get a bad rap, what with Christmas cakes constantly involving dried and candied fruits folded into sugary pastry bricks. It's too bad, because a sweet cake baked with apples, pears, persimmons, or any of the fall fruits can be close to perfect with zero frosting involved. Which is a big plus, in my book. Well, unless you've got a really badass icing recipe. I like to have lots of fall fruits around when the season is upon is -- they store so well it seems silly not to keep them in the cooler, just in case. But I find that Logan and I aren't actually too fascinated with fruit. Not enough to use up all of those pretty new apples and pears. And when you don't want to bother with making gluten free pie crust (or feel slightly disappointed that your apple pie filling recipe isn't perfect yet) you can make this apple cake. It's brilliant with pears as well. I love warm ginger and aromatic cardamom paired with apples, so I've added those -- along with cinnamon and vanilla -- to the batter. With a big scoop of vanilla ice cream (I like So Delicious Coconut Milk-based Vanilla) it is seriously not to be missed. The addition of buckwheat flour in the batter gives it a hint of earthiness that complements the sweetness of this cake. Think of this cake as a treat, to be sure, as it's made with real sugar. I ate this on my birthday for breakfast with coffee, and then for dessert with ice cream. Cake twice a day should be the new normal for birthdays. A few notes: I used powdered sugar in this cake, which is certainly not the baking standard. When you whip butter and cane sugar together for a cake, the fat coats the sugar trapping air — which gives the whipped sugar and butter more volume and results in a lighter cake. Because powdered sugar is very fine butter doesn’t wrap around the sugar as it would with larger crystals — which means you get less air and volume. Powdered sugar also has a drying quality in cake, and gives you an almost candy-like crust. There’s plenty of fat and moisture in this cake to offset those factors, so the cake is really lovely. Feel free to use cane sugar, just make sure you substitute the same weight not the cup measure. I used a mix of local gala apples from Saunders Brothers Orchard, but you can use honeycrisp to great effect as well. As stressed in the original recipe from Alanna of Bojon Gourmet (the true genius behind this cake glory, you should check out her blog! ), you really should use sweet white rice flour which helps your cake bind together naturally. Although I’ve used regular rice flour in this cake before in combination with 1 teaspoon of whole psyllium (beat it into your butter/sugar/egg mixture) to great effect. If you have celiac disease make sure to use certified gluten free oats. This recipe was originally posted on Relay Foods. Thanks to Relay Foods for sponsoring this post! All ounce measurements in this recipe are weighted. Position a rack in the upper third of the oven and preheat to 350ºF. Grease a 9″ springform pan with Earth Balance or coconut oil. In a small bowl, combine the powdered sugar, cardamom, ginger, black pepper, and cinnamon. In a large bowl cream together the Earth Balance and the chai sugar using an electric hand mixer on low speed until combine and light, about 3 minutes total — scraping down the sides of your mixing bowl about half way through. Add the eggs one at a time, beating until just incorporated after each addition. In a medium bowl, combine the rice, sorghum, oat, and buckwheat flours, baking powder, and fine salt. Add half of your dry ingredients to your creamed butter and fold together until just combined. Add your kefir and vanilla extract and fold together until just combined. Add the rest of your dry ingredients and fold together until just combined. Core your apples. Cut one of your apples up into 1″ cubes, enough for about a cup, give or take. Slice your other apple into wedges, a 1/2″ wide at the widest part. Mix these wedges with your lemon juice to prevent oxidation (this is for aesthetic purposes only). Ever so gently, add half of your apple cubes to the batter, and fold them in. Then fold in the rest. Spread your batter into your greased springform pan evenly. Place your apple wedges into your cake in a circle, creating a sort of fan with the slices, with the peel facing up. Press them into the batter slightly, just to get the batter pooling up in between the slices. Bake the cake until the top is golden and cake is set, 45-50 minutes. The sides of the cake will be just pulling away from the edges of the pan and a sharp knife in inserted into the hot cake will come out clean. Let cool to room temperature before serving. Serve this cake with ice cream or a sweet whipped cream. It really takes it to a whole new level! She’s a beaut as a breakfast cake, too, served with coffee.